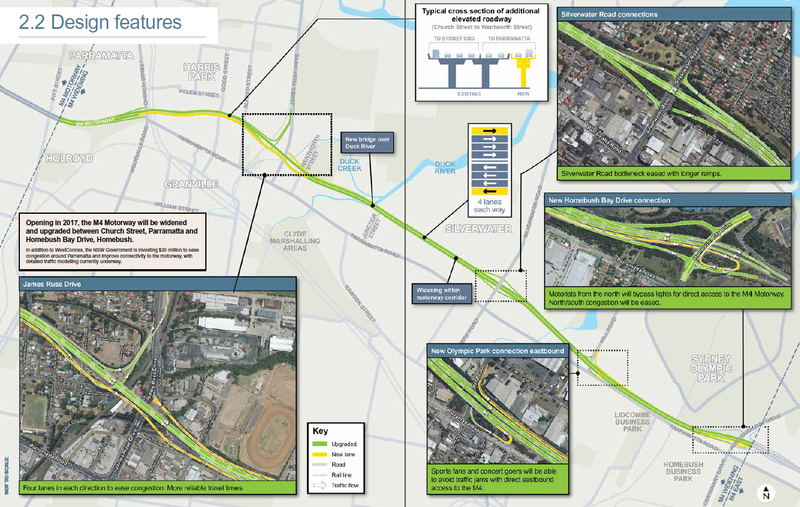 Analysis done for the Sydney Morning Herald finds that the WestConnex freeway will cost $473m/km to build. The high cost has been attributed to the high level of tunnelling required to build it; large parts of the 33km freeway will be entirely underground. Comparable surface only roads have a much lower cost per km, such as the M7 ($58m/km), or the planned roads to support an airport at Badgerys Creek (ranging in cost from $50m/km to $89m/km). Roads in other states that make heavy use of tunnels came in with higher price tags than WestConnex, such as Melbourne’s East-West Link ($1,000m/km) or Brisbane’s Airport Link ($747m/km). Courts have been told that initial traffic forecasts for the Lane Cove Tunnel (LCT) of 57,686 cars per day were inflated up to between 150,000 and 187,000 cars per day in a bid to win over investors for the project. The LCT ultimately opened in 2007 with 66,000 cars per day, a figure much closer to the abandoned projection than the final one used. The forecasters, Parsons Brinkerhoff and Booz Allen, are being sued by two funds, AMP Infrastructure Equity Fund and the Retail Employees Superannuation Fund, who claim they relied on the forecasts when making investment decisions about the LCT. The funds are seeking over $144m in damages, more than half of which is interest on the initial loss. 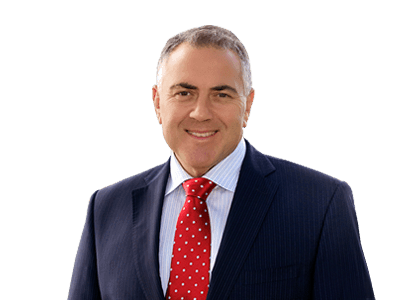 Australian Treasurer Joe Hockey described proposed changes to the fuel excise as progressive, telling ABC radio that “the poorest people either don’t have cars or actually don’t drive very far in many cases”. His comments were strongly criticised and Mr Hockey apologised for making the comments 2 days later, saying that “I can only apologise for any hurt I’ve caused”. The people of NSW will have the opportunity to suggest ways to deal with Sydney’s traffic problems under a plan by the Premier Mike Baird to crowdsource solutions to this problem. The plan follows similar initiatives in cities such as Los Angeles, Toronto, and London. The NSW Finance Minister Dominic Perrottet spoke favouorably of ride sharing app Uber, saying that NSW “should welcome the sharing economy as something profoundly conservative”. 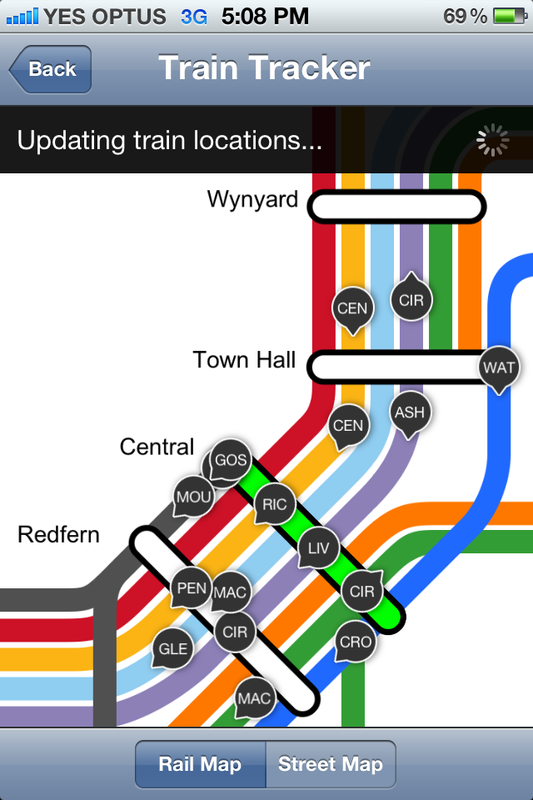 This contrasts with the existing NSW Government policy, which puts strong limits on apps like Uber. “Services must be provided in a licensed taxi or hire car, by an appropriately accredited driver, authorised by Roads and Maritime Services” a Transport for NSW spokesperson said, adding that those not following these rules could be fined up to $110,000. Do poor people drive less? Break in transmission: This blog has gone without updates for a few weeks due to illness and a family holiday. Things should now return to normal for the foreseeable future. In other news, today marks 3 years of this blog! “The people that actually pay the most are higher income people, with an increase in fuel excise and yet the Labor Party and the Greens are opposing it. They say you’ve got to have wealthier people or middle-income people pay more. Later that day he backed up this statement with a clarifying statement, which stated that “average weekly expenditure on petrol in absolute terms increases with household income, from $16.36 at the lowest income quintile to $53.87 at the highest income quintile”. 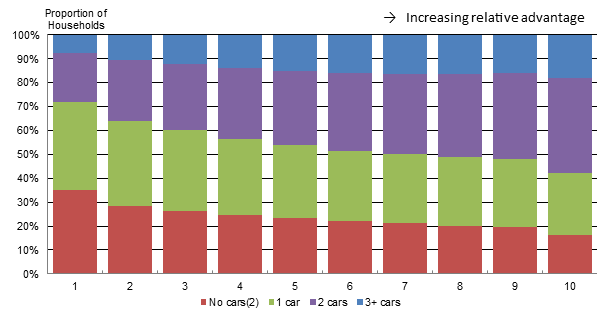 Meanwhile, it also showed that households with low socio-economic advantage were more likely to own no cars and least likely to own 3 or more cars. The opposite was the case for households with high socio-economic advantage. Critics were quick to take issue with Mr Hockey’s claims that this was a progressive tax. A progressive tax is defined as a tax that increases as a proportion of income as income rises. So to be progressive, an individual must not only pay more in tax as their income rises, but more tax as a proportion of their income. On this basis, although the richest quintile spent 3 times as much as the poorest on petrol ($53.87 vs $16.36), they also earned 11 times as much as the poorest ($3,942 vs $360) according to a report by the left leaning Australia Institute. The result is that the highest income quintile spent only 1.37% of their income on petrol, compared to 4.54% for the lowest income quintile. An increase in the price of petrol per litre would, according to this, disproportionately hit lower income households harder than higher income households. The Shadow Transport Minister Anthony Albanese also criticised the increase in the fuel excise due to the government’s decision to cut all funding to urban commuter rail and other public transport. Doing so prevents individuals from being able to switch from the soon to be more expensive driving option to taking public transport, according to Mr Albanese. RMIT Professor Jago Dodson analysed Mr Hockey’s statement as part of a fact check for The Conversation and found that it ranged from conditionally true to not necessarily true as well as partly unverifiable. Professor Dodson concluded that there was insufficient data available to fully verify that “poorer people either don’t own cars or don’t drive very far”, while finding the statement “higher-income people pay the most fuel excise” to be true on the basis of absolute spending on petrol. However, this did not hold up when considered as a proportion of income, which is the basis of determining whether a tax is progressive or not – another one of Mr Hockey’s claims. In addition, Professor Dodson also stated a preference for using disposable income as the measure of income, rather than pre-tax/pre-welfare gross income figures that the Australia Institute report used. When looking at spending on petrol as a percentage of disposable income, it is the middle 60% of income earners who spend the most on petrol followed by low income earners and finally high income earners. The lowest income quintile spend less on petrol than all but the highest income quintile. All this shows that the answer to Mr Hockey’s rhetorical question is actually a much more complicated answer than the headlines may suggest. Lost in the whole discussion over whether and how much poor people drive cars is the question of whether re-indexing the fuel excise is good policy. The answer is yes. The reasons are listed in detail by Alan Davies at Crikey. In brief, this policy will raise an additional $2.2bn over the next 4 years via the elimination of a tax cut rather than a tax increase. Indexation merely prevents the erosion of the tax base as prices increase. It will also make public transport more competitive while acting as a price on carbon (which did not exist under the carbon tax as petrol was exempted). When determining how taxes are raised, it is better to tax the things that we as a society want to discourage. That is why alcohol and tobacco are taxed, that is why there was a push to put a price on carbon, and that is why the fuel excise is a good tax. If we choose to shift the tax base away from these areas, then it means taxing things that we as a society want to encourage, like income taxes on salaries. Alternatively it means cutting back on government spending. Neither of these is preferable to taxing something like petrol, and it is therefore disappointing to see this being ruled out as a revenue source. Where the government has made things difficult for itself is in ruling out funding public transport, urban commuter rail in particular. By doing so, it opens itself up to criticisms that it can’t use the price signal to encourage a shift from driving to public transport while simultaneously raising barriers to public transport by cutting funding. It would also make its life easier if it attempted to compensate the lower income earners from the impacts of re-indexation. This could be done at a low cost according to Mr Davies: “the poorest 20% of households could be compensated for indexation if just 8% of the additional revenue raised was returned to them through the tax-transfer system”.